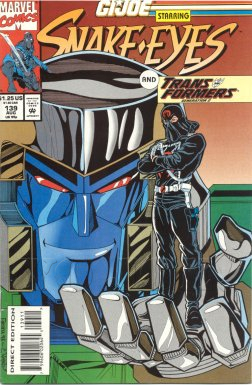 And thus begins one of the worst planned Hasbro comic crossovers as we're reintroduced to the Transformers in G.I.Joe only to watch the Earth be laid to waste in the TF: G2 series (and never be acknowledged again in the GIJoe series). I hated when they laid waste to Earth in G2 as the Joes stood by and did nothing. Sometimes the stakes were just way too high with Furman. To be honest, stories like that take me out of the story. There should be the threat of annihilation, not the actual thing. Where do you have to go from there? The interesting thing about this crossover is that it was clearly a Hasbro/Marvel mandate, but a few issues after it’s over Cobra Commander mentions Megatron again. As the castle transforms (again) he says “No wonder Megatron mistook it as a Decepticon.” Forced line of dialogue to remind readers G2 was out there? Even though I didn't care much for the crossover, I still enjoyed the heck out of TF G2 series on its own. 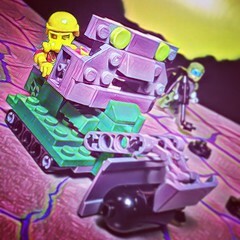 I found it more enjoyable than the last few years of the G1 series. Bummer it only lasted a year or so. On the Joe comic side, I was loving Destro in his IG uniform with the Silver mask. Big fan of IG Destro. Don’t understand why he has to be V.1 all the time. Issue #139 is live to discuss. Yo Joe! Medi-Viper! Hama invented a new Cobra that won't make it to the toy line until 10 plus years later. Nice splash pages. Megatron battles Cobra's human torches...or, he made them human torches. D.r BJ talks to herself for exposition purposes. The return of the classic HISS tank now with rail gun...that won't make it to the toy line until 20 years later. Alley-Viper V2 in full effect. Nice art. Then the art switches...Batista's art is...suitable for the era. Clean and cartoony compared to Wildman. Snake-Eyes looking evil. Storm Shadow guilt tripping Destro for no good reason. If Snake-Eyes don't want to see Scarlett get hurt, Snake Eyes and Scarlett need to retire. Zarana changed her hairstyle and ripped her jeans more. And she's oh-so-pouty-looking in that close-up. Slice the accuser. He and Dice are like the only ones in Cobra not interested in the giant robot that arrived and tried to kill everyone. Back on Cobra Island, abandoned...why? It was essential as part of Cobra being a sovereign power and having a consulate. Zartan, unlike Destro, actually updates to his then current action figure look. And why is he on Cobra Island? Cobra burnt the freighter and the bodies, which were all skeletons last time they were shown. Had time to take cloning stuff. All this but didn't make a new run of BATS to guard the island or anything. Left working HISS tanks behind, too. "Dr. Mindbender was a warped genius, he could've brought back Tesla, Gandhi, or Marilyn Monroe..." Umm, Destro, darling, you helped him gather those bodies to make Serpy. Zartan's speculates what's going on and is right, BECAUSE HE ALWAYS IS. I didn't miss him. So how does he know all this? He's being hanging out as Cobra viper-whatever for months? Does it matter? HE'S ZARTAN. "A Decepticon's word is good!" Somehow...I wouldn't trust Megs. Mindy's in the bacta tank, baldness and stache and all. Letter's page? Are those still a thing? Summary: Full on toy commercial crossover, but the Joes play minor roles. Zartan is back and won't be going away. THANKS, HASBRO. Mindy is on his way back and likewise. THANKS, HASBRO. Transformers vs GI JOE is retconned into being a Hama-verse thing, despite Hama having disavowed the old mini-series. Last edited by Sean_C; Today at 02:32 AM..
A dull-ish stay home issue. We're used to a lot more cringe nowadays! The series takes another big dip in quality with the departure of Wildman. It will never recover, as we'll get a string of truly horrible artistic attempts in the next couple of issues. This issue is also a prime example of the importance of having a proper inker. Baskerville does the first half, and the art is almost indistinguishable from last issue. I've seen a lot of fans think Wildman ghosted the first half. They should've tried to keep Baskerville, at least, and salvage what they could. It's funny how Hama writes a pretty mean Megatron, considering he was kinda forced on the book. In the actual TF-comics, Megs was often treated as pretty much a jobber, but in Joe he's an unstoppable badass throughout. An interesting contrast to the bumbling main villains in this book. Swapping the ark for a rail gun sounds like a pretty crap deal, though. I had forgotten how many new toys we were still getting in this era. Here we get the new Alley-Vipers (unidentified for several months, I didn't recognize these guys! ), Zartan and I guess Mindbender counts, too. Seeing them always makes me sad, remembering how I waited for years to get them in the stores. I was sure Medi-Viper was a legit new toy! Nowadays I don't regret not buying all those neon travesties, of course, though that Alley-Viper design is still cool as heck. Mindbender's return reminds me what a douche the Finnish editor was around this time. We got both Megatron and Mindbender spoiled in the friggin' letters page! OK, it helped build excitement at the time, but how about leaving some surprises for the actual stories, too? Joes are being douchebags here. Destro was just trying to hang out in his cool threads before Cobra attacked him. On the upside that other know-it-all Destro is played like a buffoon here. Gee, who could this familiar-sounding mystery man with Zartan's eyeliner and holographic FX be? Wildman had to have ghosted the first half. I can't see an inker making that much change by himself. Not that I know anything about inkering. I recall reading how Jack Kirby's inkers cost him detail, actually.